What a gorgeous insect this fly can appear to be! It flew right into our courtyard and landed with ease on the leaf of Dieffenbachia Amoena ‘Tropic Snow’ as I was checking for mealy bugs that are rampant on some of our foliage plants. How wonderful to be able to capture some images of it before it flew away. 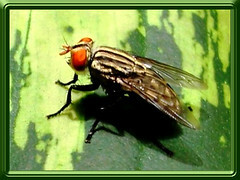 Flesh Flies are medium-sized (10-20mm long), larger than house flies, and often mistaken for the latter due to quite similar markings and coloration. Most of them spot bright red eyes and are light or dark grey in color (unlike Blow Flies that have metallic-colored bodies), and present a checkerboard-like pattern atop their abdomen. 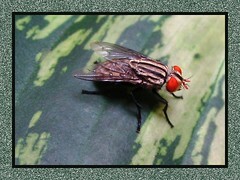 The adult Flesh Flies have three dark stripes on its thorax whereas the House Flies have 4 stripes. Like the Blow Flies, the Flesh Flies are associated with dead animal carcasses which are their primary breeding site, though they’re also found in garbage, dung, or other decaying organic matter, as well as on the open wounds of mammals, hence their common name. Distribution: The genus Sarcophaga are very common and widely distributed throughout the world, though species distribution varies and are very difficult to identify. Habitat: Found wherever there are carrion, decaying organic matter and excrement as breeding grounds, usually in urban and rural areas though rarely in houses or eateries. Food: Adult Flesh Flies do not bite but feed on a wide range of sugar-containing liquid substances such as nectar, sap, fruit juices and honeydew. Most larvae feed on dead or decaying flesh of animals, wounds and excrement. There are, though, larvae of certain species of Flesh Flies that are parasitoids of other insects, feeding on eggs, nymphs, or larvae of more harmful insects. Lesser house fly larvae, blow fly larvae, and grasshopper nymphs are common hosts of Flesh Flies. Thus in a way these parasitic Flesh Flies are beneficial, ridding our environment of these harmful insects and dead animals. Life Cycle: Some Flesh Flies lay eggs that are deposited on or near suitable food, though a few species give birth to larvae (maggots) where the eggs are already hatched in the uterus of the female. The larvae complete growth within a few days, then burrow into soil to pupate for a week or so and emerge as adults about two weeks later or longer, dependent on favourable conditions. Flesh Fly pupae can remain dormant for long periods. Maggots of some Sarcophaga species hibernate as pupae in autumn and do not emerge as adult flies until late spring. Check the Australian Museum to know more on the fly life cycle that include development times. Other info: Did you know that Flesh flies are helpful in forensic entomology as they are usually the first to arrive at a carcass after an animal dies? By using the larvae of these flies found at murder scenes helps the entomologist to determine the time of death. Blow Flies and Bottle Flies are helpful in this manner too. Learn more from Wikipedia. Could this be Sarcophaga aurifrons (Grey-striped Fly), I wonder? Quite similar to an image seen at OzAnimals.com on Australian Wildlife.